I was more than honored that Raymund from Ang Sarap asked me to guest post on his blog. If you haven’t met Raymund or his tantalizing array of food, then you have sadly missed out. 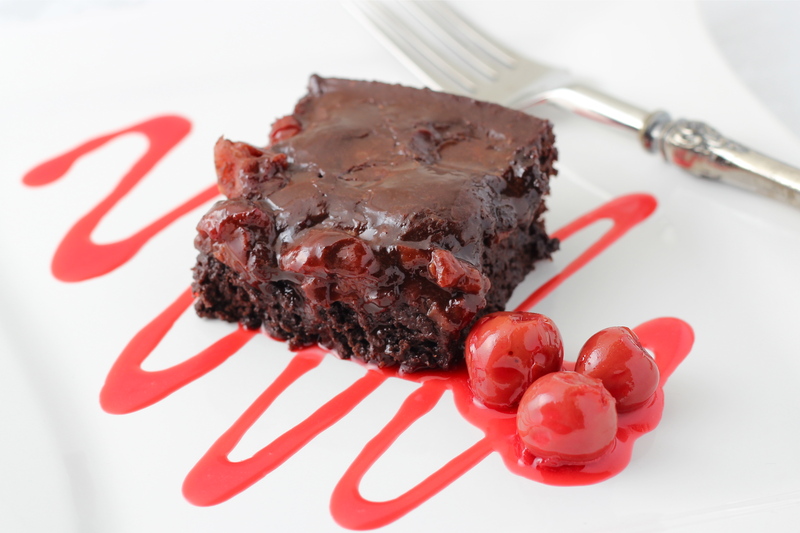 It took me awhile to figure out what I wanted to make to feature on his blog, but I finally landed on these Cherry Chocolate Brownies with bit of Brandy. They are lower in calories and fat than your typical brownies but still crazy rich and chocolatey and they definitely have an added zing from the brandy. And like any good brandy, these sweet treats actually get better with age. Let them sit in their gooey splendor, brandy adequately getting to permeate throughout it, and you will be one very happy camper. To continue reading this post and for the recipe, click here. Categories: Chocolate, Cookies, Other Desserts | Tags: brownies with brandy and cherries, cherry chocolate brownies, low calorie brownies, low-fat brownies | Permalink. Looking forward to checking out! Hi Geni thanks for participating in the Guest post series, its truly a pleasure to have you. The recipe rocks! just look at that photo. I’m sold! Booze and cherries in a sweet dessert, what’s not to love!?! No need to explain anything, Geni. The title and photos say it all. Great recipe! Cherries, chocolate and brandy…can there be a better combo? Low cal, low fat…and they are DELICIOUS too! Off to see the rest of this gorgeousness! You can never go wrong w/ brownies! Love the look of that oozing cherry inside! Hi Geni! I saw your guest post and wanted to come here and say HI! You have lots of amazing recipes. Looking forward to following you! Ok these look beyond words GOOD!! I don’t think I’ve ever gotten tipsy off of brownies before, but I might eat so many of these that it will actually happen. Off to check out the recipe! Thanks for this fabulous recipe and hope you are enjoying your week! What a great guest post, Geni! These look absolutely delicious and chocolate and cherries are the perfect combinationand with brandy??!! You know, I’ve never even had the stuff. I think this may be the recipe to change all that.